Also sometimes I need use dollar sign $ as well but it seems to be a special char, too. What is the way to escape those in LaTeX? Outside \verb, the first seven of them can be typeset by prepending a backslash; for the other three, use the macros \textasciitilde, \textasciicircum, and \textbackslash. Note that the seven "single non-letter" macros don't gobble the space following them. For the last three that do gobble up the space after them you can try one of these methods to add space. After \verb should go a character that's not used in the text to print "verbatim" and the same character should follow the text. This command has a drawback: it can't be used in the argument of other commands. will work as well (when T1 font encoding is active) and will print the string in sans serif type. Not the answer you're looking for? Browse other questions tagged symbols tex-core characters or ask your own question. How to type & in LaTeX? Is it possible to write the '%' symbol in text in LaTeX? how to insert % symbol in a statement without intending comment? 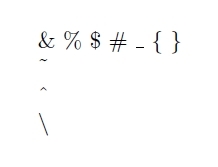 How can I print escape characters in LaTeX? How to handle % character in LaTeX? How to format a large text containing special Characters and breaklines?